The Star Wars saga is as much a part of my DNA as is the very air that I breathe. In fact, it’s so imbued that I happen to have three versions of the original trilogy. It shouldn’t surprise me then that it would be on “Star Wars Day”, May the fourth, that — as a matter of sheer and utter coincidence — today would be the day when I start ripping my old VHS copies. Honestly, I didn’t realise this until later! There’s nothing I could add to what hasn’t already been said or written about the Star Wars movies. They are legend, loved so much by so many that George Lucas’ tinkering in the late 90’s was seen not as an act of completion but, rather, an act of vandalism to our collective culture. Han Solo shot first. Period! We all know that there exist several versions and numerous minor edits. 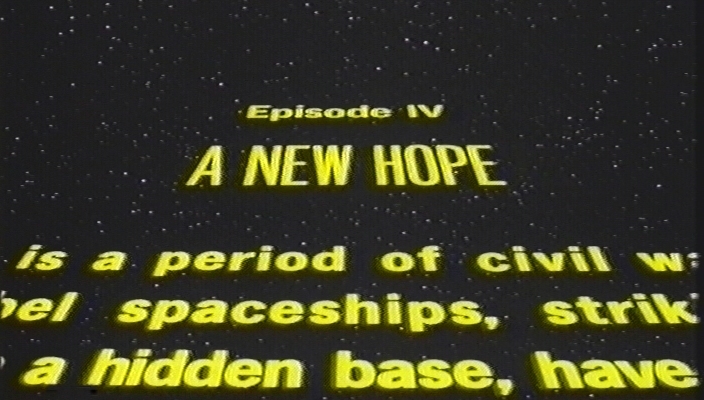 The first change, however subtle, that strikes is right in the beginning, in the opening crawl: my 1995 VHS version adds the new full, official title of “Episode IV – A New Hope”. It doesn’t appear on the DVD version (2006) of the original theatrical cut. Another interesting observation is that there is no mention of James Earl Jones whatsoever — but that (if lore is to be believed) was at his own specific request because he didn’t think that a space opera of the low budget kind would do his career much good. His lack of faith is disturbing. PS: And if you think the storm troopers are bad shots then, well, the rebel fighters wouldn’t be able hit the floor falling down either! This entry was posted in Movies and tagged digitization, Star Wars, versions, VHS. Bookmark the permalink.